Three St. Vincent records: Marry Me, Actor, and Strange Mercy. When reflecting on a past relationship, one song can bring back a tidal wave of memories. You go to a party with someone new; and just as his hand reaches for yours, the turntable clicks to a song that your first love used to play for you on lazy Sundays. You have a record that you used to enjoy, but now resent; every chord reminds you of her. You&apos;re picking up milk at the grocery store when you hear a song that you danced to at a wedding once, and that stab of recognition is enough to make your lungs gasp for air. When I met you, I was all of 18. I liked Coldplay and Damien Rice. You introduced me to Bob Dylan, Spoon, and Nick Drake. 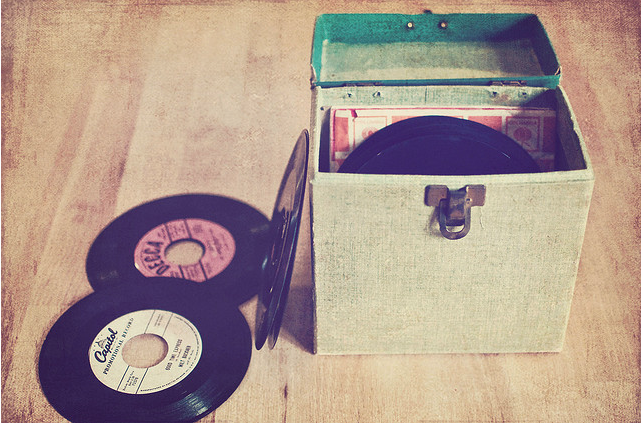 To the tune and timbre of your records, I fell in love. We cooked pasta to Andrew Bird. We fell asleep to Iron & Wine. We sang in the car to The Avett Brothers. We dissected the lyrics of Wilco and Arcade Fire. We made memories to Neutral Milk Hotel, St. Vincent, The Decemberists, and Radiohead. We were happy. And then we weren&apos;t.
Life without him was an apple that I needed to eat, eat, eat, but I couldn&apos;t. Without his worldly guidance and protection, his superior knowledge of seemingly everything that mattered, I was convinced that biting into the forbidden fruit would destroy me. My own demons were already too much to bear; I needed relief. I needed him to save me. Little did I know that attaching myself to him was the real poison, already pulsing its sweet nectar through my veins. I tore away from him eventually, and life went on somehow. I found fleeting comfort in the arms of others, busying myself to forget his face, his voice, and the way his kiss felt like nothing I had ever known before, and never would again. I made the mistake of seeing him through many a Thanksgiving and Christmas in my abandoned hometown, stealing nights and promises that didn&apos;t belong to me anymore. Now, he was just an idea of a person. He was a shell of what I needed him to be; a dream that kept me warm at night. I willed his declarations to mean something. I pretended that he cared. I didn&apos;t understand why he kept hurting me, as if breaking me was a bad habit that he just couldn&apos;t shake. I kept entertaining the notion that he would change, that he would turn back into the person whom I used to know so well and now missed so terribly. If you&apos;re feeling sad and lonely, don&apos;t tell him. If you are happy and successful, don&apos;t tell him. When your health is failing, when the doctor tells you in no uncertain terms that your death is imminent, don&apos;t even think about telling him. I&apos;m stronger now, physically better. A small ache still lingers, like a tiny, hot needle that stings ever so furtively, but the heaviest burden is gone. The most exquisite, excruciating pain has been lifted. I&apos;m no longer in love with a ghost. I&apos;ve made peace with my past; I&apos;ve learned to let go. I fumbled through relationships with others, finding myself along the way. I found love again, this time with someone who is equally capable of loving me back. I&apos;ve realized that this is what true happiness feels like. I still listen to your records; I only think of you sometimes. I bit into the apple. I&apos;m still here. Leah Pickett writes about art and popular culture for WBEZ. Follow her on Twitter @leahkpickett.